What is it about the simple old low-res style of pixel art that appeals to some people? Could it be that there’s more to it than just happy memories to gamers, and more than just challenging restrictions to artists? I submit that really low-resolution art like that is the equivalent of playing with action figures, because of the imagination it requires both from the artist and the viewer. The artist has to do the most with the least, and then to trust the viewers to fill in the finer details themselves. This I think is really what made early video games so fun, even though today they seem so primitive. You remember what I’m talking about, you rapidly aging guys who got your NES back in first grade. Back then, you and your friends had imagination by the bucketload. You were playing with your Teenage Mutant Ninja Turtles in the back yard for hours at a time with adventures that topped the cartoons. Shredder was commandeering the yard’s corner oak tree for a super base that would let him drop bombs anywhere in the world. The Turtles discovered his plan and covered the tree with protective Rectomutagen ooze and acorn mines which created a radioactive forcefield, but when the Neutrinos crashed into its proton pack power source, it ripped a hole through space and time sucking the Autobots into the yard, who then helped defeat the Technodrome which could suddenly fly because Krang filled it with helium. Nothing made sense, but that was hardly a problem. You had the important elements – the physical characters to control – and you filled in those minor story details. It was imagination sugar. So when you’re first introduced to a man who fights walking mushrooms with angry eyes, who throws fireballs when he touches flowers and who has to avoid egg-hurling turtles flying in tiny little clouds, you don’t even bat an eye. Heck, these people are talking your language. Japan threw all kinds of Nintendo games at us that appealed to kids who wanted to exercise their insane little kid imaginations with dragons, giant robots and bubble-breathing dinosaurs. But here’s the important ingredient that added an extra layer of magic for your imagination: for a lot of these games, there was no story. They didn’t tell you why you were doing any of your death-defying missions. Mario started out on his very long journey without any backstory, without any cut scenes, without any character development. You’re in “world 1-1”, you have 3 lives left, go. Your only hint about motivation was a mushroom-baby thing occasionally telling you a princess is in another castle. Whatever. You had the important elements – Mario, who could walk and jump – and you filled in those minor story details. Digital imagination sugar. The effects that these simple presentations had on you could be very real. I remember playing the original Double Dragon in the arcades, always starting out with Marian getting comically punched in the stomach and kidnapped, and me going out to get her back. I got pretty good at the routine. Then Double Dragon 2 came out and I was all ready to see her get captured in a burlap sack or something. I put in the quarter and saw the boss from the last game appear in front of her and “OMG HE SHOT HER DEAD! !” The scene only took about five seconds and was presented so matter-of-factly that as Billy Lee was coming out of the door to start the level, I was still stunned. Added to the fact that I was getting slaughtered by the first few enemies because of the game’s insane difficulty and that the hand for the “Go!” icon looked suspiciously like it was Marian’s, and it made for the kind of traumatizing experience that you can now only get after playing through 50 hours of Final Fantasy character development. It was a kind of understated, tastefully minimalist style. Granted, it was a limitation forced on the designers by the technology, but then again, “absence of limitations is the enemy of art.” Other games worked well with that minimalism. The fond memories I have of the NES Metroid was how much story and atmosphere I filled in myself while the game provided the bare minimum. Today the game is considered forgettable, but back then, with my then still healthy imagination racing at full gear, I was going through the caverns exterminating alien termites for the above-ground lunar colony, listening to the music, then suddenly I entered a room with one enemy that was slightly bigger than the others. I didn’t know who it was or what was so special about it, but the chipper blips of midi tunes suddenly turned into a low, ominous drone. That tiny little change instantly told me something huge was happening. I was fighting Kraid, who by post-Super Metroid standards appeared decidedly unimpressive. There wasn’t even a giant warning screen or special gate to break, I just unexpectedly walked in on him like it was another room. It made things almost realistic that way, at least compared to the overly dramatic punch-in-the-face warnings you get today that A BOSS IS APPROACHING AND YOU BETTER GET READY NOW ARE YOU READY? The effect was later amplified when the music turned into just a mechanical hum near the end of the final level with the appearance of the terrifyingly fast and colorful metroids. The minor shifts in environment, color schemes, music and sounds told my brain that this was the most serious event of my life and I was going to need every drop of adrenaline that I could produce, immediately. After reaching Mother Brain, with those eerie chip tunes and direct level layout, you could tell that this was what everything in the game was leading up to. It only took a few simple elements to get your teeth chattering for an hour afterward. On one side, you have games that do the most with least. You have to concentrate a little more, deciphering what this clump of pixels are, what that clump is, and so on. You take cues from the music about what’s happening, and in a sense, you play along with the game like you’re both playing with digital action figures. Eventually, as is the nature of technology, games would get more sophisticated. Ninja Gaiden’s cutscenes were like you took your Nintendo to the movie theater. Cutscenes? In a video game? Wow! Games started getting more complicated with open world exploration like Zelda and other RPGs, which required more guidance for the player. They still left a lot for you to explore on your own, but the hand-holding was beginning — either through characters giving you hints about what to do a la Castlevania 2, or through Final Fantasy style narratives. While this wowed the kids and helped players get more out of the game, something was being lost for the kids who could give life to GI Joe figures and enjoyed coming up with their own insane adventures for them. Less and less was being asked of kids’ imaginations, more and more was coming from adult storywriters, and ultimately, simplicity was being replaced with complexity. In the first Megaman game for instance, there was nothing to tell you what you were doing or why, you just knew you had a gun and everything else was trying to kill you. But you could pick up hints about what was happening by certain clues. The background in one of the Dr. Wily stages showed that you were invading the bad guy’s base through some type of sewer pipe like a commando, for instance, and that once you beat this white-haired scientist guy, he begged for mercy, so you didn’t kill him. This suggestion of a story was given to you subtly but quickly, keeping with the game’s fast pace. A lot of it was still a mystery, but the mystery was tantalizing because you were so invested by then. Fast forward to Megaman X4 and beyond, and you’re getting told exactly why you’re doing every single mission, plus you’re given a backstory for every single boss, in several paragraphs of detail. This, I can only imagine, to add sophistication (“extra complexity”) to the story, layers and layers of maturity to character development (because what I really want when playing a video game is to be reading The Iliad), and all the other checkboxes from our textbook chapters on what all good stories must include because simplicity is kid stuff and kid stuff is for losers. No need to bring your imagination for this Megaman: that story is being fed to you with tweezers. Why am I so bothered by that? Because video games have certain unique aspects that other media can’t offer, and when you keep pushing in this direction, you lose them. In Super Metroid, Samus responds perfectly and naturally to your controller and she doesn’t have any lines to deliver or opinions to share. Your relationship is one way only, which makes the character a 100% extension of yourself. Your brain sends signals to move not just yourself now, but her. You *are* Samus. Whatever event happens next in the game, no matter who you are or what culture you come from, you can relate perfectly to it – because it’s happening to ‘you’. Getting everyone in the world to relate perfectly to your character isn’t easy to do. Thus at the end, when *spoiler* your baby metroid sacrifices itself to save you, guess what. There’s no “uh-oh I wonder how that’ll affect her” or “I wonder if there’s a cutscene coming to show what she does“, because there is no ‘her’. There’s only ‘you’. And ‘you’ are now going ballistic and getting ready to slaughter the monster that did this. The master storytellers behind the game know this: your suit suddenly rockets to obscene power levels so you can beat the living snot out of Mother Brain. They’ve moved beyond controlling a character in a script to controlling you, all by keeping things simple. No cutscene, nothing getting in the way, nothing to take you out of the experience. It’s all you the whole time. That story happened to ‘you’. That’s using the video game medium to its fullest. …And then you have the opposite side, where you get everything spelled out to you for an hour, characters are developed for you by people who might not share your tastes, and your imagination has less to work with. Compare this to Other M, where you spend half the game stopping gameplay to watch Samus react to things in her own way, come up with her own thoughts, and share her own opinions. She’s her own (the writers’ own) character now and it’s more like you’re just guiding her movements during the parts of the game when it’s your turn. You’re watching the character make more of the choices, and it’s breaking your connection with them. It’s going back to what TV does and losing what only video games could do. And when that gets taken too far, guess what you finally wind up with. If you correctly said Quick Time Events, join me in pressing X to pay your respects to our imaginations. The point of all of this is that while big-budget games need to impress people with immersive experiences that guide you through where you should go and why you should do specific things at specific places, with detailed maps and UI overlays giving you dozens of mission details, goal requirements and trivia about the type of bullets you’re selecting, it’s the tastefully minimalist or low-budget games that keep your imagination young and healthy. I came across a similar comparison between radio dramas and television that explained this idea in a similar way: “Television has a far greater hold on the person who wants to sit and have things come to him pre-digested, and which do not require anything more than staying awake, whereas radio made demands.” Sometimes I miss videogames that make those kinds of demands. If I ever need to create an ideal learning environment for my kids, I’ll raise them to believe that the NES is the world’s only game system. And since one upside to games that aren’t Immersive Experiences is the ease with which you can put it down, they’ll be able to go off to the back yard afterward and enjoy their last summer before first grade defending a tree from the Shredder. I agree completely with you. Nowadays every single detail is thrown to the players leaving the imagination limited to the plot itself. Most recent games I’ve enjoyed a lot, have been Shadow of the Colossus and The Binding of Isaac. Leaving gameplay behind for a moment, these share the characteristics, leaving huge portions of the plot to be completed by the players imagination. Just look at how many interpretations of what’s going on with Isaac exist, the imagination is working. I definitely think you’re on to something here. I think this is actually a good reason why games like Yume Nikki have developed a cult following. (That and stupid Lets Plays). I think the higher-res, better graphic fidelity we have, the more explicit we have to be. That doesn’t mean modern games can’t do this, just that it’s made more difficult by the level of detail we now have available. I’ll jump on the Dark Souls train and suggest it as a very good example of a modern game doing player-explorable narrative right. I think that the quintessential example for engaging storytelling without over-explanation comes from, appropriately, the oldschool pixel-lovers at SNK in Metal Slug 3. 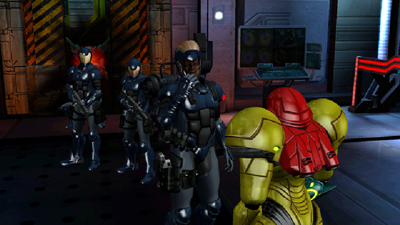 If you played through the first two games up to then, you saw a transition from straightforward “army guys going after enemy army guys” that escalated into an intergalactic war against space aliens. All played out without a single word being spoken or a cutscene, just purely through the gameplay. That game in particular comes to mind as the perfect mix of imagination sugar and immersive storytelling. I guess that can work for people who have the kind of wild imagination it took for such a simple scene to have such a big effect in the first place. Still, solutions like that and the Final Fantasy 7 “save Aeris” hacks have me imagining a game, let’s say a Double Dragon 2 remake, where that sort of thing is intentionally built in. So say if you beat the game under certain conditions, you get a shot to restart the game (“go back in time”) with the chance to save the normally killed character if you act quickly enough, and get a slightly different branch of the story. Maybe just consisting of a few altered bits of dialogue and a replaced end scene. All it’d take is a few minor additions to the game’s code, as fanmade hacks have shown.